Books in general that discuss Autism can be tricky since Autism can vary so very widely from person to person. Being the huge spectrum that it is, it’s effects can be completely different from one person to the next. So writing a book, aimed at children, that attempts to explain some of what Autism is, can either be wonderfully enlightening or it can be a colossal fail. In the case of “Ben Has Autism. 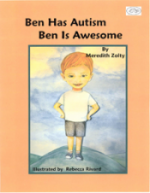 Ben is Awesome!”, we have a wonderfully enlightening book that does a very very good job of explaining the pros and cons of Autism in a way that anyone, regardless of their age, can relate to. Ben is a 5 year old that has Autism and as such, has his difficulties but also has some strengths in some areas. This book explores them all in a way that literally anyone can understand and in many cases, even relate too. While not really a story, this book does have a logical progression as the reader explores the weaknesses and the strengths of Ben due to having Autism. This book is really great in that it covers enough autistic traits that you really get the feeling that the author could have written about your own child. It turned into a bit of a game as the boys would try to figure out which one of them did or felt the way Ben did in the book. Most of the time it was Cameron, since he also has Autism but sometimes it was Tyler… and others it was both of them. Every page of this book has big, colourful illustrations that are very imaginative and illustrate the words perfectly. The words are big, bold and even though few, are perfectly descriptive. It’s a great book for the children as it helps them to recognize some of the things they’re feeling and helps them to identify it as a trait of their Autism rather than having them just feel they’re “weird” or “strange”… it is also great for the parents in that it helps to realize that you’re not alone. Other parents wrote this book, other parents relate to this book… other parents think that their children are awesome too. It’s a big plus for understanding Autism, not just for “people” but also for those that most of us have a hard time explaining it to… children. Ben Has Autism. Ben Is Awesome! is available in paperback and hard cover. I definitely recommend picking this up and adding it to your child’s library both for your child and yourself. Order Ben Has Autism. Ben Is Awesome! here.